The problem with installing subwoofers in your car is the space requirements. Trying to fit a 15 inch speaker where there simply is not enough room, can mean you are going to lose a lot of space needed for other things. This space issue becomes even worse when you factor in putting your subwoofer in an enclosure. Large subwoofers mean larger enclosures, which can sometimes weigh upwards of 40 Ibs. That weight and space are going to make installing and running large subwoofers even more expensive; especially at the gas station. Free air subwoofers are designed to give you that much-wanted bass, whilst still conserving space. That’s bass, without a loss of space. Because of this, when compared with other competition speaker options, the free air subwoofers are usually smaller. Moreover, they don’t require the mounting boxes larger options do. Here are five contenders for the best free air subwoofer which may appeal to you. A bit on the low power side, but a great value if you can fit it in your budget. Kicker is one of the most reliable, popular and experienced manufacturers of car subwoofers in the industry. This 8-inch subwoofer shows that. Specification wise, it seems to be somewhat lacking in some areas. For example, the speaker is only 200 watts. Kicker, however, has focused more on audio quality with this unit. The design and materials used mean that it still offers and incredibly loud volume leve for a reasonable price. 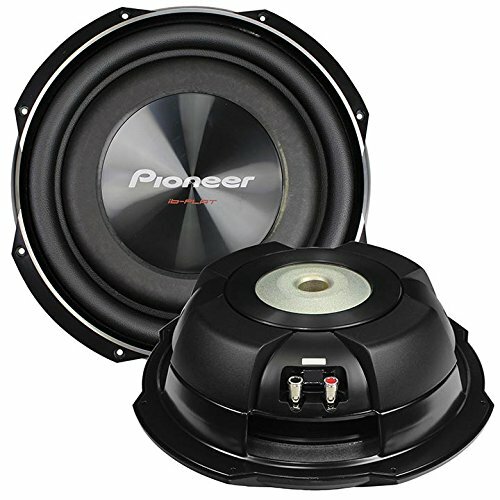 Slightly higher price point, but worth checking out if you prefer the Pioneer name or need a bit more power. The Pioneer TS-SW2002D2 is another 8 inch free air subwoofer. However, compared to the Pyle PLPW8D, you are going to be spending over twice the amount of money. Does this pay off? Well, you are going to get an extra 200 watts of power behind the speaker, which means you will get louder and better quality sound. The design of the Pioneer TS-SW2002D2 is defiantly much better and sleeker than the Pyle PLPW8D. People might take a second look at this, and the design does not mean a lower quality performance wise. The highest decibel level and power on our list, the GTs are great if your system can handle them. The Blaupunkt GT Power is very possibly the best free air subwoofer on this list. It comes with the most power (1100 watts) and has the highest decibel sensitivity (91dB). This speaker also looks great. The blue and black design give it a sleek and expensive look, whilst the unit itself is relatively inexpensive when compared to some of the alternatives. At less than $50, this is a bargain. One issue users might find is that they are in the market for a free air subwoofer in order to conserve on space. This unit is not going to be as effective as an 8-inch free air subwoofer. If space conservation is your main concern, then make sure to buy a smaller product. Our favorites from Pyle, the PLPW8Ds are the cheapest speaker on our list, but great if you just need a small upgrade or replacement for your system. The first item on this list is the Pyle PLPW8D. This is the cheapest speaker on this list by quite a lot. You might think that this means the speaker isn’t of a good quality or isn’t well constructed. Well, compared to other, more established brands such as Kicker, the build quality just can’t compare. However, the Pyle PLPW8D is still a very good 8 inch free air subwoofer. Unfortunately, the design of the Pyle PLPW8D is incredibly basic. It’s not going to make anyone appreciate its aesthetics. One step up from the 8" models on this list, the 10" Kicker is great if you are in need of an upgrade with a bit more bass. So you want to upgrade from an 8 inch, but still, want the space saving capability of the free air subwoofer. The kicker 10c104 is a relatively large speaker at 10 inches. However, compared to a lot of the competition, it is a very competitive entry. The experience kicker has behind them really manages to make the 10C104 shine. With a bigger woofer cone, the Kicker 10C104 can move more air, and so produce more bass than the 10C84. This was five of the more popular free air subwoofers currently available on the market. Free air subwoofers are great if you want to save space, but most of the time they don’t manage to live up to the larger and more powerful alternatives out there. If you have the space and the money, you might be interested in having a look at 12 or 15 inch models. If you are going to do this, remember that you won’t only need more space, you will need more power as well.